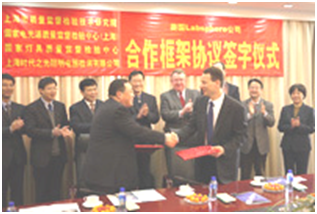 NLQSTC (National Lighting Test Centre, Shanghai -China) has signed agreement with Labsphere, Inc.
North Sutton, New Hampshire – Labsphere, Inc. has signed a cooperation agreement with National Lighting Test Centre (Shanghai). The partnership, facilitated by Labsphere distributor, Shanghai Alpha Lighting Equipment Testing Ltd., is centered on Labsphere’s TOCS LED Measurement System. Meet us in "THE LED EXPO Pragati Maidan, New Delhi, INDIA Dec 1 – 3, 2011" Labsphere Inc. USA is exhibiting in this event. event link <http://t.co/Sky9ujg> Labsphere Inc. USA is presenting a lecture on LED test & Measurement.